A Madison native, Kiley has been with Whole Pet since October of 2013. As Client Services Manager, she prides herself on her exceptional customer service skills and unrelenting positive attitude. 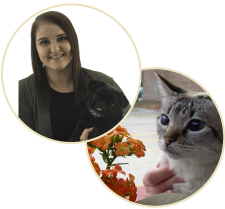 She very sincerely values the relationships she’s formed with clients and their fantastic pets, and strives daily to create the best possible environment for them. Kiley shares her home with an especially funny little pug, Otis, and Patsy, his adoring cat sister. When she’s not chatting you up at the front desk, she enjoys writing and reading nonfiction, cooking for and spending time with friends, making people laugh, and (ideally) vacationing with her truly wonderful parents.